Anyone living in a small apartment space may feel as though the only way to truly be comfortable is to get rid of several pieces of furniture. While this is one option, you can also take the approach of reducing the clutter, and in some instances replacing furniture with more efficient substitutes. Every inch of an apartment counts when the floor space is limited. Get organized with simple room-by-room solutions. Buy small furniture or trade-in overstuffed chairs and couches for sleek, minimalist designs. Purchase furniture that offers hidden built-in storage compartments, like this Storage Cube with Reversible Tray. This versatile little piece can serve as an ottoman, end table or an extra seat. Flip the top over to find a built-in tray with handles, making it a perfect little cocktail table with hollow storage space inside. Available in black, white, red and gray at Wayfair for $139. Set a flat panel television above a fireplace or mount it on the appropriate wall. 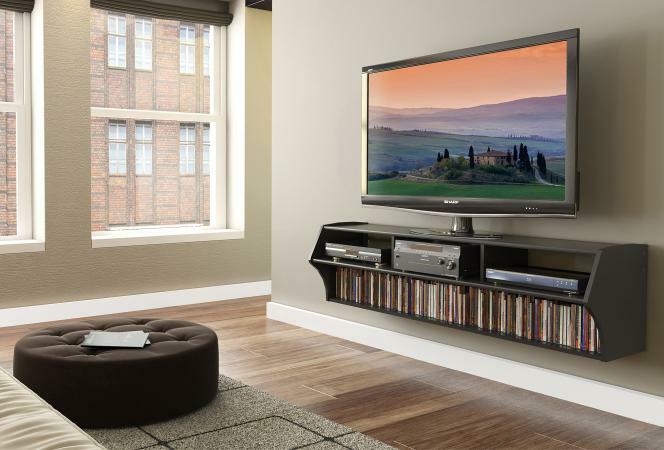 Replace a bulky entertainment center with a slender console table or a floating TV Stand with storage shelves for DVDs, CDs and even small stereo systems. The Altus TV stand comes in espresso, black, and drifted gray for about $150 at Walmart, and stretches nearly 5 feet across. Just be sure to get permission from landlords to install the unit in the wall. Use floating shelves or shadow box shelves for a clean, uncluttered look on the wall to display small framed photos, collectibles and knick-knacks. Get a coffee table that has a bottom shelf to store magazines, books, and children's toys in baskets. Buy an end table that features a built-in lamp and magazine rack. When floating the sofa in the center of the room, place a sofa table with lamps at each end behind the sofa to free up walking space on either side. Tall bookshelves or freestanding shelves painted the same color as the walls provide tons of storage and display space while keeping an open look in a small living room. A rolling cart with baskets is a great solution for items that may move from room to room. For example, keep art supplies, sewing materials, laptops and organized financial paperwork, and daily mail on this rack. It easily rolls from the living room to the kitchen table and hides away in a bedroom when company visits. Transform a rolling cart into a stylish mini bar for entertaining -- it adds a fun, retro vibe to casual cocktail parties and is readily available where ever its needed. Think vertically - hang pots and pans on the wall or from the ceiling. Mount a pegboard to avoid putting multiple holes in the wall and get permission before hanging a pot rack from the ceiling. Get rid of appliances and cookware that you don't ever use. Organize drawers with dividers for optimal storage. Expand your counter space with a cutting board that fits over the sink. This 12 by 24 inch over the sink cutting board by Snow River includes a built-in stainless steel colander. Get it for just $18 at Amazon. Make your own magnetic spice rack for the side of the fridge using small baby food jars. Find the tutorial at One Lucky Pickle. Install door organizers inside kitchen cabinet doors. Lazy Susans come in a variety of shapes and configurations designed to maximize space inside cabinets. 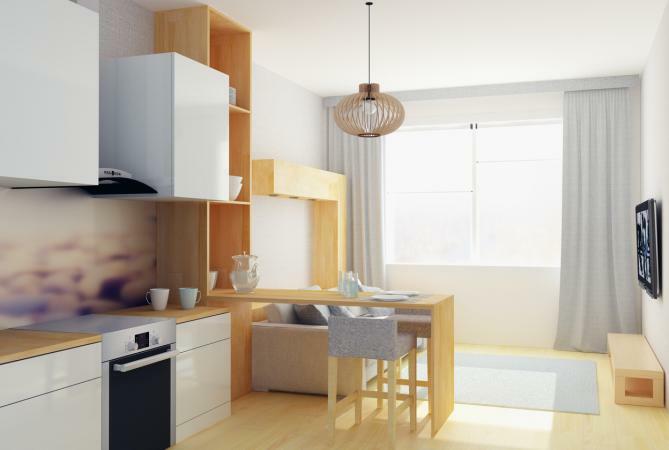 Small apartments often combine kitchens, dining rooms and living rooms into one living area, leaving a small space near the kitchen for the dining table. Get one that has collapsible leaves, allowing it to shrink when not in use. The table could also serve as a desk when needed and as a room divider, depending on the layout of the apartment. Use a basket that hangs over the shower head for storing shampoo, body wash and washcloths. Keep make-up attractively contained in a specialized make-up organizer. 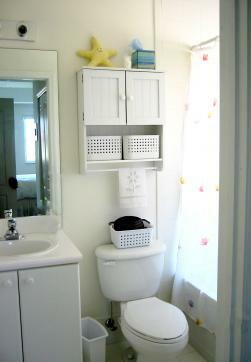 Mount a cabinet with open shelves over the toilet or position tall wire racks that stand above the toilet to store towels, toiletries and other necessities. The rack from The Container Store is just under $140 and features three 9" shelves in iron. Glass corner shelves are an attractive storage option that keep an open feel near the vanity. Mount baskets turned sideways to the wall for storing rolled towels. Increase sink space by getting a small shelf that sits on the back of the counter, going over the faucet. Don't overlook unused space on the back side of doors - install hooks on the bathroom door to hang towels and robes. The Duo Over-the-Cabinet Towel Bar and Basket ($13 at Bed Bath & Beyond) has padded foam brackets that slide over any standard bathroom cabinet door with a handy little basket for soaps and cleansers and on the opposite side, a bar holds a washcloth and hand towel. Multi-purpose furniture helps free up additional floor space in small sized bedrooms. 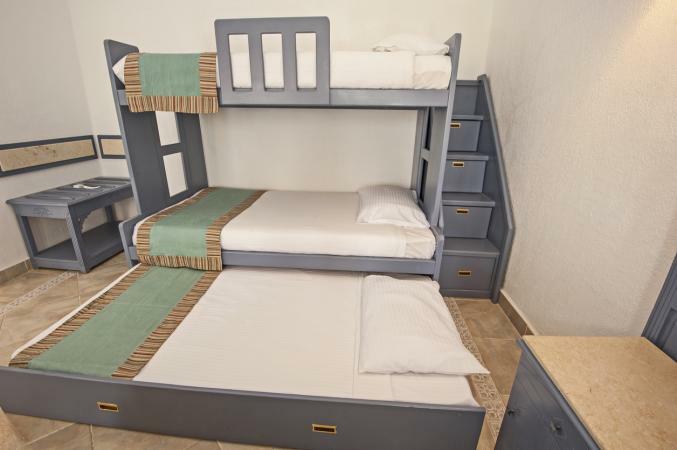 Bunk beds are a good option for families with multiple children that must share a bedroom. Some even include a third trundle bed that slides out from underneath the bottom bed. You can find bunk beds with trundles in various neutral finishes with a clean, Mission-style look at Bunk Bed King, starting at $326 for a twin-over-twin. Loft beds are a great space saving solution that put the sleeping space directly over a desk or play area underneath. Consider using a folding table or a table that folds down from the wall as a desk. Eliminate the need for a dresser and nightstand by getting a bed with built-in drawers underneath and a headboard with shelving and lighting. In the master bedroom, place an upholstered bench or ottoman with hidden storage at the foot of the bed to store extra blankets and pillows, such as the stylish Linon Stephanie Ottoman by Linon. Covered in linen fabric with your choice of dark walnut with botanical print or grey/black with an elegant script print. Both options give it a timeless feel that will make it a standout accessory in any contemporary setting. It's available at Amazon for about $70 to $100. Switch out seasonal clothing, storing it in vacuum-sealed bags below the bed when it is out of season. Reduce the volume of bulky items like blankets, pillows and comforters by as much as 75 percent by storing them in Space Bags by Ziploc. Removing all the air with a vacuum also keeps your fabrics free from dust, insects, mildew, moisture and musty odors. Get one large (21 1/2 by 29 1/2 by 5 in.) and one extra-large (26 1/2 by 39 1/2 by 6 1/2 in.) reusable cube bag at The Container Store for $15. For simple, inexpensive solutions try collapsible, fabric organizers that hang from clothing rods and shoe racks that hang on the back of the door. 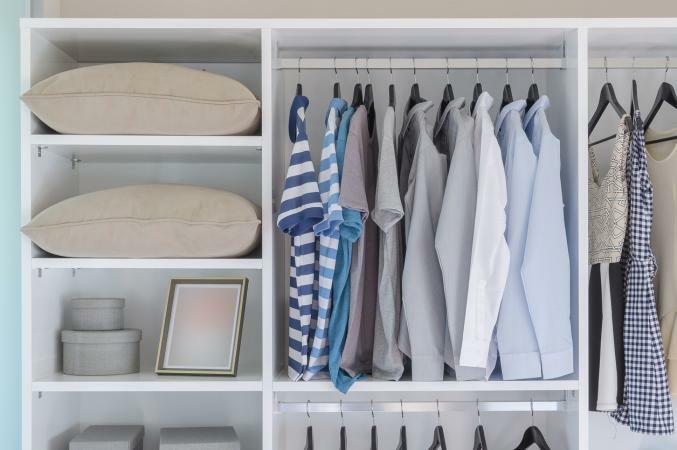 Maximize closet space with a wood laminate or ventilated wire closet organizer, which includes shoe racks, clothing rods, stackable drawers and cubbies for t-shirts and socks. Wire closet organizing systems are another option, so learn the pros and cons of different types and brands before deciding which one to purchase. Purchase risers for current beds so that flat plastic store containers can be slipped below them. Even with the coolest gadgets installed in your closet, you may still need tips and advice for the best way to organize a closet or good ideas for organizing shoes. Upon entering, immediately put shoes and coats in their rightful place. Discard any junk mail immediately, filing the rest in its appropriate spot. Have children pick up their toys before bedtime every night. Think twice before purchasing a knickknack or other decorative item. For every decoration purchased, get rid of one you had. Follow a weekly checklist for house cleaning that helps keep things looking neat and tidy. Hold a yard sale a month after moving in, to help fund storage solutions and get rid of items that do not fit in the apartment. Staying organized in a small apartment is a process. 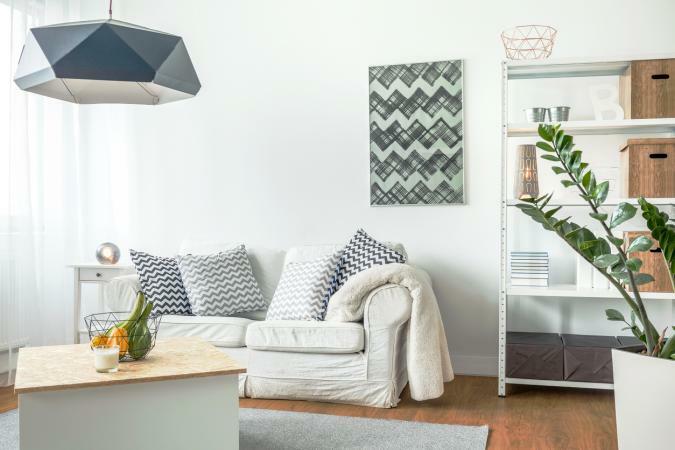 Purchasing solutions can get expensive, so tackle one room at a time and carefully select anything you are considering bringing into the apartment, whether it is new, an old favorite, or a hand-me-down item. Once you have the apartment set up optimally, keep it organized by doing weekly room maintenance and cleaning.